Giles Auty, The Weekend Australian , 'Country characters', pg. 19, Sydney, 27 Dec 1997-28 Dec 1997, 19 (illus.). This article appeared in the 'Arts' section of 'The Weekend Australian'. Helen Campbell, Look , 'Russell Drysdale 1912-1981', pg. 14-15, Heidelberg, Apr 1998, 14 (colour illus.). 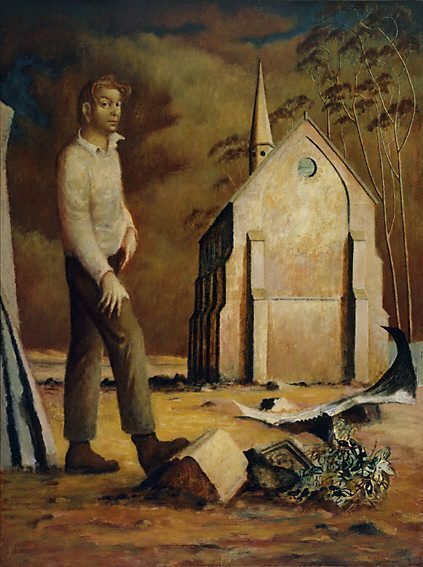 James Gleeson, Art Gallery of New South Wales Quarterly , 'Russell Drysdale', pg. 39-43, Sydney, Oct 1960, front cover (illus.). Paul Haefliger, The Sydney Morning Herald , 'Drysdale, Fox exhibitions', pg. 7, Sydney, 23 Mar 1949, 7. Tatlock Miller, Sun , 'Russell Drysdale's fine exhibition', pg. 12, Sydney, 23 Mar 1949, 12. Favourites: Margaret Olley and Jeffrey Smart selections , Sydney, 2002. NOTE: No catalogue numbers; titled 'Portrait of Donald Friend'; Margaret Olley selection. Open air: portraits in the landscape , 'Open air: Portraits in the landscape', pg. 3-66, Sydney, 2008, 39, 42, 44 (colour illus.). Jill Sykes, Look , 'Donald Friend: memories of an artist and good companion', pg. 29-31, Sydney, Feb 2007, 29 (colour illus.). Daniel Thomas, Hemisphere , 'Drysdale's art changed the Australian outlook', pg. 12-18, Sydney, Nov 1960, 16 (illus. ).